Look Out Quebec Here Comes The Lefebvres! 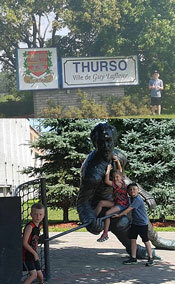 We were up early for our last day in Ontario July 28th which was Terry Fox’s birthday and we went to his monument while in Ottawa. We crossed over the bridge into Quebec after 45 days in Ontario. We spent some time in Ottawa with Susan Stewart touring around, then we crossed the bridge together and it was neat to see that on the Ontario side all signs were in English and French but when we crossed over the bridge everything was French only. There was nothing in English at all! This was interesting since we didn’t have Mom with us for the first week or so as she went back home to visit her friend Donna before she passed away. I got a chuckle out of watching Kristie squirm when someone started talking to her in French… With my little bit of understanding and some ability to speak French we did OK and figured it out. 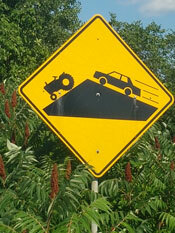 We were looking forward to seeing some of the countryside in Quebec and it did not disappoint. The campgrounds were absolutely great and beautiful, most of them had pools which the kids really enjoyed. There was still with a hint of smoke in the air around us as we made our way to the middle of Quebec due to the fires. We did get some rain in the evenings once in a while and a slight bit during the day very infrequently. If we have had rain for more than 15 days of our trip so far during the day I would be surprised, which has been good for walking but not for the fires! It continued to be warm here and the sun definitely had some heat to it and lots of humidity. I have adjusted well this year as I usually don’t do well in the heat, where Kristie and Mom are having a little trouble since they are in the motorhome most of the time with the A/C running as it gets really hot in there during the day. So far we have been doing good with sunscreen and haven’t gotten any sunburns since we left home, besides the one I got on the first day. We have used A LOT of sunscreen though! 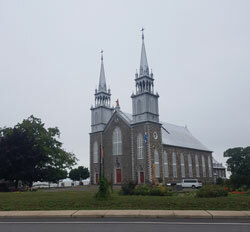 One of Quebec’s many old churches. The humidity in the mornings being this close to the water made things interesting and I was usually soaked within the first 30 minutes of walking in the morning. The boys are starting the countdown for Hockey and Dylan for Skating and they are also excited to get back to school and to see their friends. It will soon be less than a month. The mornings have been great and I am feeling excellent rolling out 4-5 hours at a time. These increments are not much of a hassle now! Feet, legs and body are feeling great and I am getting excited to be through one more province and on to the last stretch of our mainland journey. We crossed the bridge in Trois Rivieres and followed the south shore along the Saint Lawrence river for the rest of the trip through Quebec which was absolutely beautiful, with the rolling hills and farmland, some beautiful homes and structures with the older churches and buildings, some that have been around for over 150 years! Feels like home around here with the farmland and rolling hills. Mom made here way back to us and flew into Quebec City and I went to pick her up at the airport. Unfortunately she was coming back because her friend did not win her battle and had passed away. She was glad that she went and was able to spend some time with her, I am glad she went as well as she would have really regretted not going. We were able to line up a dinner one night with Uncle Jimmie when he was on his way past trucking to Montreal. It was nice to catch up and visit for a while and try to order food in French! Having to stay on the secondary highway all the way through Quebec made travel at times a little challenging for the motorhome, although most days we were able to walk right up to our campsite, it wasn’t too bad. There were some Massive campgrounds in Quebec with some having more than 1500 sites, most of which were seasonal sites, seems like a lot of people enjoy camping. A phone booth, what a concept! Kristie and I celebrated our 10 year wedding anniversary on this awesome journey. Which was only just a night out for a nice dinner and a grocery shop for some supply’s. 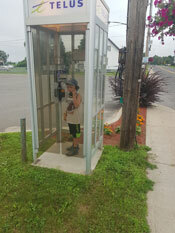 Interesting to see phone booths still all over the place in Quebec in the little towns along the way and to show the kids what they are all about, we even had to check and see if anyone phoned. As we were finishing off our walk through Quebec, we had to jump onto the four lane to complete the last hundred kilometers or so as the secondary highways were ending. We didn’t see a police or QPP officer the whole two weeks we were in Quebec until we we got to the four lane highway, then we were visited by 4 of them and with only 14 kms left, we were instructed that we were not allowed to walk on the Trans Canada, so we had to adjust andcontinue on the secondary roads for the rest of the day until we finished the day crossing over the next border into New Brunswick. Five provinces down only two more to go now! 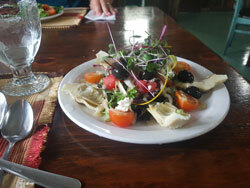 Keep an eye out for our trek through New Brunswick! To support the Can-Survive Walk, visit our Donations page. Donations both big and small will go towards the L Foundation’s endowment fund. Thanks in advance for your support! To date, over $36,400 has been raised to eradicate this dreadful illness. According to the Canadian Cancer Society, over 80,000 people in Canada died from the disease in 2017. Beautifully expressed with such colourful picture for us to imagine! Amazing this has been and continues to be a fantastic journey for you all!! Thanks for sharing with us all!